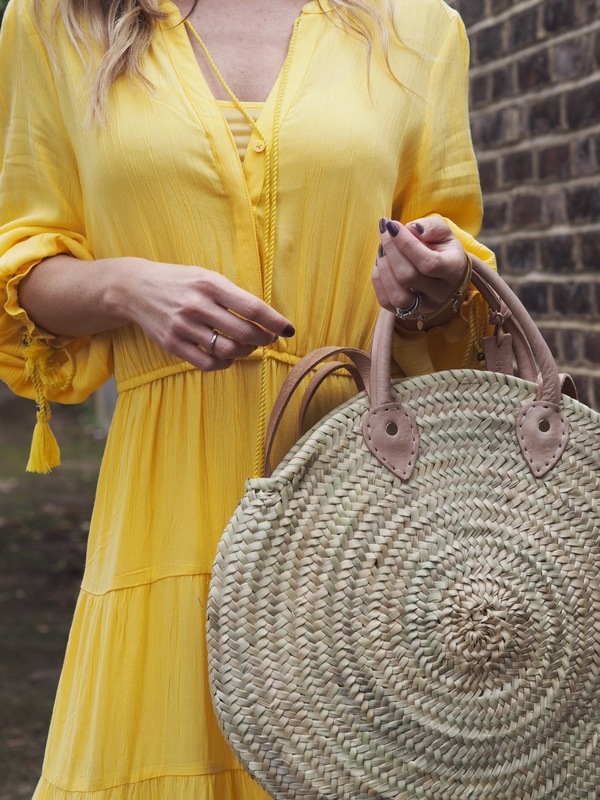 I have blogged about yellow dresses before, but they were very much little summer holiday dresses, and this yellow dress is one that you could easily dress up for a wedding or a christening. Truth be told, I wasn’t 100% sure about it when I saw it in-store, but I bought it anyway, because I seem to be having a ‘thing’ with yellow at the moment. Maybe it’s the current lack of sunshine? Anyway, when I got home I tried it on and it smiled at me. I smiled back, because it’s the kind of dress that makes you feel soooo good when you put it on. It’s really feminine and floaty, not to mention comfortable and the sleeve detail is so pretty. It’s also a great length. It comes with a little yellow slip that you wear underneath, but you could wear it without the slip over a bikini from beach to bar. 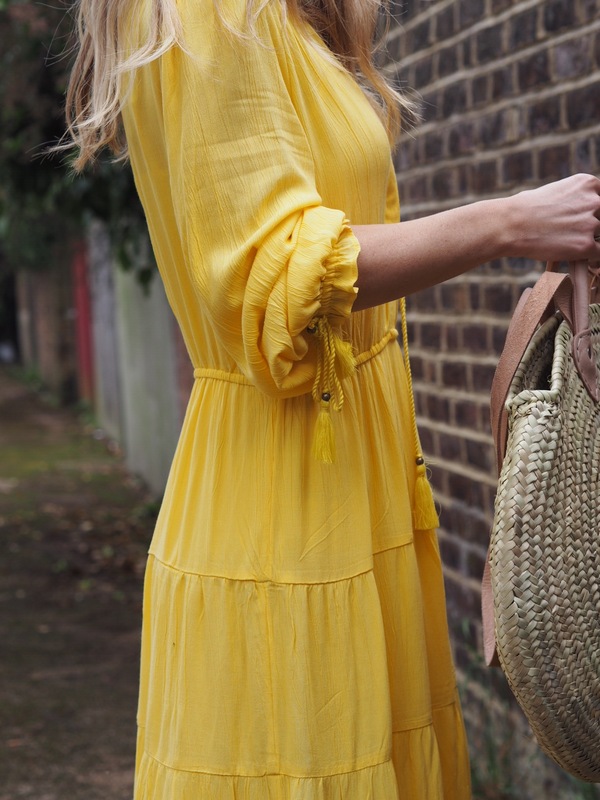 M&S Yellow Dress – £49.50 – currently 20% off if you are a Sparks Card Holder. I have dressed it down with my Golden goose trainers, but it would look so good with a pair of flat tan sandals. I have had a few people ask me recently about outfit ideas for a christening. I think this dress could work beautifully dressed up with a pair of heels like these below. 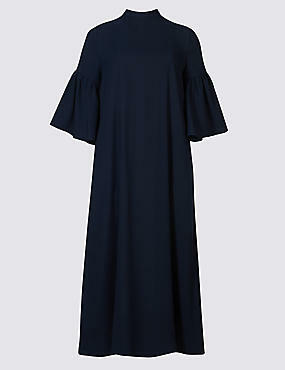 Another dress that would be perfect for a christening, is this navy dress from Marks and Spencer which was released yesterday as part of their ‘next season, see it, buy it’ collection. It is SO chic and could easily be dressed up with a pair of statement earrings and strappy sandals, or dressed down with a pair of trainers. I know it doesn’t look like anything in this little photo, but it really is beautiful on (a couple of the PR ladies from M&S were wearing it!) The best feature is a little tie at the back which weirdly, they haven’t photographed for the website. This is a dress that costs £45 but could pass for a Victoria Beckham if you nail the styling. Pair it with a pair of gold strappy sandals and some statement earrings and you have a beautiful, understated and chic outfit. I will keep looking and thinking about other christening outfit ideas, but thought I would share these two as they are such great buys.